The most recognizable phantom from Ghostbusters is, of course, Slimer. After him comes Mr. Stay-Puft and then, if you're a big fan of the movie, the Terror Dogs. 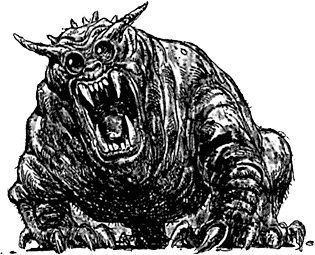 When a cult of Gozerians resurfaced in the early 20th century in New York City, they included statues of Gozer's servants as Terror Dogs in the plans for their rooftop temple, and those were the forms Zuul and Vinz Clortho took when they breached our dimension. Pursuing and possessing humans who lived near the temple, Zuul and Vinz Clortho returned to their Terror Dog forms once the portal to Gozer's dimension had been opened. 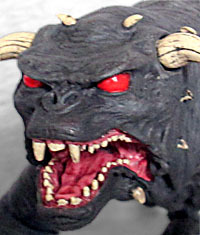 When NECA had the Ghostbusters license all those many years ago, they made Gozer and Slimer and a pair of Terror Dogs. Those Dogs have been mad expensive on the secondary market since they came out, so everybody has been eagerly awaiting DST's attempt. In Dan Akroyd's earliest drafts of the script, the Ghostbusters would have been employed by a wealthy benefactor who was also a collector of supernatural artifacts. One of his items would have been "a zuul," the favored pet of Gozer, and all the problems in New York were the result of Gozer trying to get his pet back. It wasn't until the later drafts that "Zuul" became the name of a specific Terror Dog (and at that point, the Terror Dogs were actually on the run from Gozer, and possessed humans so they could come to the Ghostbusters for help). The Terror Dogs do not really look very much at all like dogs. They have four legs and a head a stubby little tail, but that describes tons of creatures, doesn't it? Of course, it doesn't look like the bear Louis Tully called it or the cougar a policeman called it, either - the name is a holdover from one of the early designs, where they would have looked like undead dogs (the script never describes them in any detail, which led to a slew of different conceptual designs). The body is larger in the front than the back, with massive forelegs and more slender rear legs. The chest is a big barrel, and the dark, wrinkled skin looks like it's been burned by the fires of hell. The face looks more like an ape than a dog, with its heavy brow, sunken eyes, bulbous cheeks, and short, mushed-up nose. The jowls dip down to the jawline, revealing the creature's pink gums even when the mouth is closed. Open the mouth wide and you'll see a perfectly wrinkly tongue. The eyes are shiny red globes, and 10 small horns poke out of the skull in matched pairs starting on the top and circling back and down along the jaw. It's a scary looking monster, as something with "terror" in its name should be. 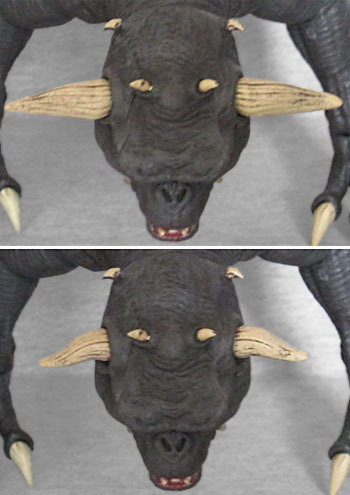 When NECA made Terror Dogs, they sold two toys with different heads. Diamond Select has opted to sell one toy with interchangeable horns - long ones for Vinz Clortho, shorter ones for Zuul (no last name given). The horns have shaped pegs, so you know you're getting them on the right sides and in the right way. They pull out with no trouble, and stay in place well. NECA gave their doggos light-up eyes, but that feature really isn't missed here. These new ones definitely get the edge in articulation. 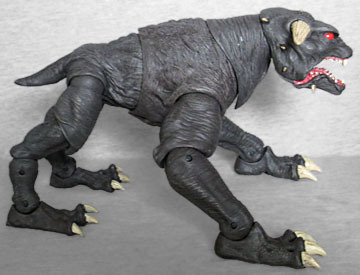 The Terror Dog has a balljointed head, hinged jaw, swivel/hinge neck, balljointed torso, and swivel/hinge joints all the way down the legs - hips, knees, ankles, all that stuff. The feet aren't quite the right sculpt, but it's not as much of an error as Slimer's gigantic arms. And while the joints are good for various standing or running poses, you won't be able to get them into a proper sitting/squatting pose. Oh, plus: the "shins" were facing the wrong way when I took the Dog out of the tray; remember, the larger calf muscle needs to be on the back of the leg, not the front; luckily, the swivel joints make it easy to fix that. If you buy the Toys Я Us version of the Terror Dog, you get no pieces of the big Build-A-Rooftop diorama. If you buy the direct market version, you get a rolled up poster showing Gozer's home dimension. It's the backdrop for the archway. The Terror Dog is a good toy, but a short-sighted mistake has really hurt it. Like we said, each figure comes with the pieces to turn it into either Zuul or Vinz Clortho. Which, yeah, okay, is a great move on DST's part. However. Toy collectors are obsessive completists. Very few of us are going to be happy with only one Terror Dog, when the movie had two of them. So despite the fact that one purchase will allow you to create both of them, the fact that you can't create both at once is sure to rile fans. And therein lies the problem: there are three characters in this series, and six figures in a case - you can probably already see where this is going. You're going to walk into TRU, see two Taxi Driver Zombies, two Library Ghosts, and zero Terror Dogs. The Terror Dog's desireability is 200% compared to the rest, but it's packed at the same ratio, which means an instant shortage. 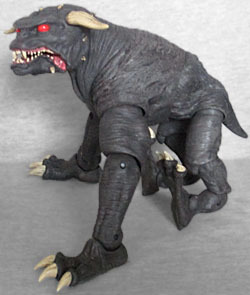 The thinking was probably that fans would buy one specialty market Terror Dog to get the diorama backdrop, and then buy one TRU Terror Dog to complete the pair. 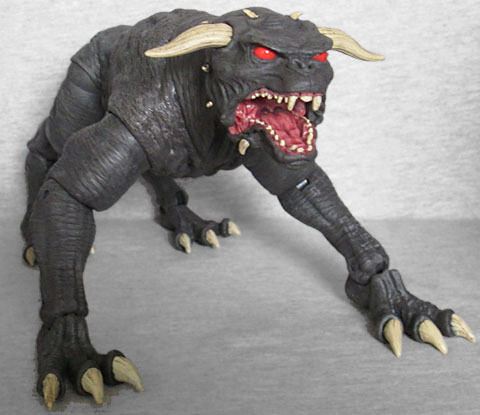 But there are a lot of fans who are getting the Ghostbusters Select toys without worrying about the rooftop, and the Terror Dog is exactly the kind of character(s) they want to get. More specifically, the kind they want to get two of. So good luck hunting one down. And if you do find them, maybe ask yourself if you really need two of them with different horns, or maybe it's better toy karma to leave one behind for a fellow collector.